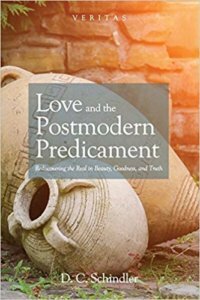 Love and the Postmodern Predicament aims to recollect the pre-modern vision of humanity through an exploration of beauty, goodness, and truth, each of which characterizes a special form of the human encounter with reality. Beauty awakens in us our desire and intellectual capacities to know; goodness is the pursuit of free action as a type of gift of self; truth is the identification of knowledge with one’s being. Undergirding Schindler’s interpretation of human nature is an understanding of love as an ontological unity of will and intellect. Neither voluntarist nor emotivist, Schindler’s concept of love preserves the full integrity of goodness and truth as different modes of the revelation of being. In chapter two, Schindler focuses on beauty which traditionally has been understood as a unity of opposites: transcendent and immanent, reason and the senses, closed order and open to beyond form. But in the Anglo-American world beauty has been reduced to its subjective dimensions as taste or pleasure. The reality of beauty has been lost in the contemporary worlds of British empiricism and American pragmatism. The reality of beauty is that if “offers a kind of paradigm of appearance so perception, which is to say that it represents appearance as perfected, isolated in its purity” (35). It captures both the essence of appearance and perception. When a work of beauty appears to us, we receive its appearance and thus are co-presence of the origin: the reality of it is acknowledged by us and forms an encounter among me, the work, and the work’s relationship with reality (37-38). The experience is more than subjective: it is real. By learning to love beauty, we develop our capacity to receive sense experience as a communication of reality rather than a reporting of information. A genuine sense of beauty makes us realize the world has its own depth and significance. It is an encounter with the world that opens our horizons to goodness and truth and awakens our will and intellect to know more about them. Schindler next focuses on goodness in chapter three by contrasting Locke’s and Aquinas’ views of the will: the former sees will as an individual, active power, while the latter understands the will as a “joint work” among the body, mind, and God. For Locke, the will is a type of power that engages in a struggle with the outside world; for Aquinas, the will is an intellectual appetite that desires what is good in the world. The object of the will for Locke is the agent’s own actions, whereas for Aquinas the act of will comes to completion in the real thing itself at which it is directed – the goodness of reality calls forth our will towards it. For example, our will desires freedom for Locke because we can be disconnected from the world. By contrast, Aquinas argues that our will wants freedom because it is seen as inherently good to ourselves and the reality in which we live. Simply put, the moderns like Locke see the will in terms of power, control, and independence and the traditionalists view the will as love, gift, and part of the being of reality. Schindler concludes the first part of the book with an examination of truth in chapter four. He beings by discussing the information-model of the modern mind where information is data extracted from an object and conveyed to a recipient. This account differs from the traditionalist who sees knowledge as the proper joining of the mind and reality in the correct form: what constitutes the very being of a thing (its ontology) and how it reveals itself to us (its epistemology). The form of a thing is its internal essence that transcends the sum of its part as a united whole. Knowledge in the traditionalist’s account therefore is intimate, personal, and relational; or, as Schindler concludes the first part of his book: “If beauty represents an invitation to the real, and goodness our involvement in it in freedom, truth is above all our reception of reality, on its terms” (81). “If it is true that love includes a reference to both orders, intellect and will, it would seem most fitting to say that properly speaking love signifies our relationship, not first to goodness, or for that matter to truth, but implicitly to both at once, which is to say that love is a relation most specifically beauty; beauty is the proper cause of love” (100). Beauty’s reality is in its appearance which is the ecstasy of love: the object “comes as it were outside of itself, and joins with the ecstasis of the perceiver of beauty” (102). It is a union, a relation between two in which they become one without losing their distinctiveness from each other, and an indwelling, in which subject and object are not only present to one another but indeed present in one another, between subject and object in a reciprocal relationship. These are the effects of love as an appetitive power. We first encounter the world in its appearances, in its beauty, which our will and intellect receive. From this encounter we are invited to love the world in our reciprocal relationship with reality, being opened to the world that must precedes any deliberate, self-conscious action. Our desire for beauty opens us to goodness and truth. Beauty consequently possesses within itself the other orders of goodness and truth that reveal themselves later as our love of the world deepens. As Schindler puts it, “This is why we can indeed say that love is a union, is caused by union, and results in union” (106). “opens up the proper context of our knowing and willing, and if beauty . . . is the proper cause of love, then we have to see, in sum, the indispensable role of beauty in genuine human existence. Beauty thus reveals itself to be crucial in pedagogy, which is the formation of the human being” (125). To be surrounded by beauty is to live an existence unified by genuine culture that “gives a beautiful form to the various activities that constitute daily life” (126). Beauty establishes affection, friendship, and natural love that provides an environment for genuine knowing and willing. It brings out the being of things and sets up an encounter between humans and the world and humans and God, the latter which Schindler discusses at great length. In the final section of the book, there is only one chapter, “Being and God,” where Schindler contends that God has a nature, a being, and needs to be understood as such rather than as a feeling or a function. However, the only way we can know God is by analogy, since God’s nature is different from ours and we cannot know it. But we know God’s creation and therefore can know God in the mediation of the world that God had created (i.e., by analogy). God’s creation therefore is the perfect example of “self-gift” and reflects the essence of love. This impersonal or objective dimension of God has been overlooked for God’s personal qualities (e.g., “my personal relationship with God”). By recovering this aspect of God, we can think of God as possessing a nature, as a type of being, that can be encountered in a distinctive way that combines humility, intellect, and piety. Furthermore, our desire to know God increases our desire to know creation too. The desire to know God is the desire to know all things as best as we possibly can. And this is the true task of philosophy: to know reality in its wonder, glory, and splendor; in be open and child-like in our desire to know; and to realize that to know wisdom is to know God Itself. Lee Trepanier is a Professor of Political Science, Department Chair, and University Pre-Law Advisor at Saginaw Valley State University in Michigan. He is author and editor of several books and also is the editor of VoegelinView (2016-present) and editor of Lexington Books series Politics, Literature, and Film (2013-present).